After four hellish exams and one ridiculously time-consuming law review edit, I finally finished my 2L year. I didn't get much time to relax, however, as my in-laws came for a visit the week after my semester ended. Whenever we are expecting company, I am reminded of how many housekeeping tasks I don't keep up with during the school-year. I rarely dust, I've never washed the windows, and we didn't even own a mop until last week. In my defense, the total area of noncarpeted floor in our apartment is probably 50 square feet, so paper towels and disinfectant spray worked fine. I decided, though, that our floors should get a proper mopping before my husband's parents visited. I bought an inexpensive mop that is intended to be used in conjunction with disposable wet or dry wipes; however, I am generally too cheap to buy refills of any sort and I find them wasteful, anyway. I've seen knitting patterns before for washable mop covers -- I looked through several available patterns on ravelry.com, but they seemed rather complicated to me. I wanted something simple to knit (i.e. rectangular) and something with a ridged surface for scrubbing. I eyeballed the size of my cover, but this four-row stitch pattern could easily be modified to fit any size/brand of mop. A word of warning: these instructions are probably best conveyed visually, so note the pictures. My mop head has little slits on the top where the disposable cloths would be tucked in. I added bobbles to the wrong side of my mop cover to tuck into these slits, ensuring that it would stay in place during use. 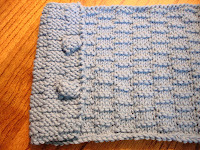 After knitting about 3/4" in pattern, beginning with the next row, I knit two stitches then added a bobble. I knit across the row in pattern, adding a bobble on the third to last stitch. I measured the distance between slits on the top of my mop head (about 2 3/4") and knit that distance according to the pattern. On the next row, I added two more bobbles as described above. 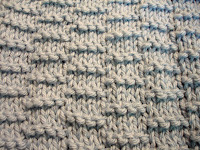 I knit another 3/4" in pattern before binding off. 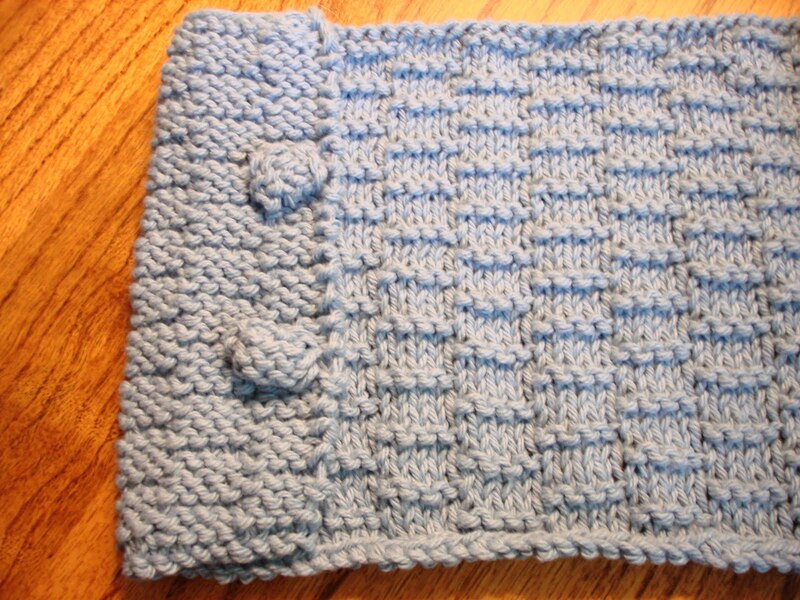 I placed the rectangle right side (mostly knit with purl ridges) facing up and folded the ends in so the bobbles faced up on either end (see picture below). I placed my mop head on top to mark exactly how far in the edges should be folded. I also marked along the top and bottom of the mop head. I seamed along these top and bottom marks across the width of the folded-over flaps. Essentially, you are creating a pocket at either end of the rectangle that will fit over the ends of the mop head once they are flipped right-side out. The bobbles will be situated directly over the four slits (hopefully). I used Lily Sugar n' Cream organic cotton yarn for this project (leftover from baby Kellan's sweater). It is machine washable, so cleaning the dirty mop cover will be super easy (and therefore I will be more likely to do it) and at less than $2/ball it is cheaper than the wet wipes made for the mop. The pattern is extemely simple to knit, and the clear ridges make it easy to find your place in the pattern if your mind wanders (as mine does . . . every row). I might use the remainder of this ball of yarn to make a couple of washcloths in this pattern; I think it would make a good dish-scrubbing surface. 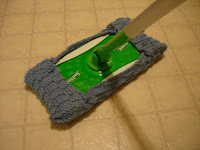 For those with wet/dry mops, this is a great project for those who are economically and environmentally concerned: by replacing disposable mop covers, it saves money and reduces the amount of waste we produce. Be creative and enjoy! 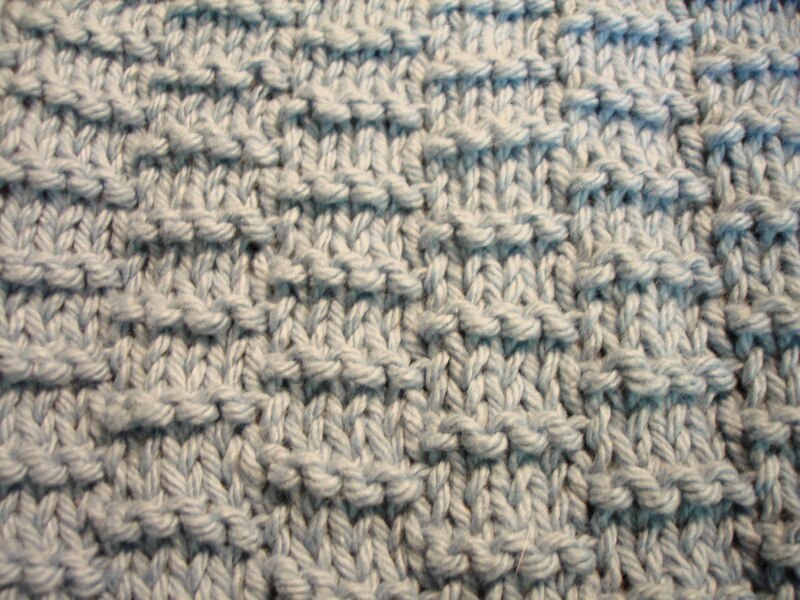 I knit across the row in pattern, adding a bobble on the third to last stitch. I measured the distance between slits on the top of my mop head (about 2 3/4") and knit that distance according to the pattern.